More examples of local stores to come soon (I always pass by a bunch of creative stores on Valencia Street in the Mission, SF), but here’s an introduction to a great little store called Gravel and Gold. For all those in the area, definitely check it out – it’s right on the corner of Lexington and 21st. The first thing you notice about the store when you walk in – besides all of the lovely, funky items they carry (from handbound leather books, to earrings, to vintage clothing, to ceramics) – is the unique, gorgeous, large wooden table that claims the center of the store. See a picture of the table below. Pretty beautiful, right? I may have to find out who made that for them…maybe they were a local craftsman or craftswoman! It looks like one or two (maybe more?) 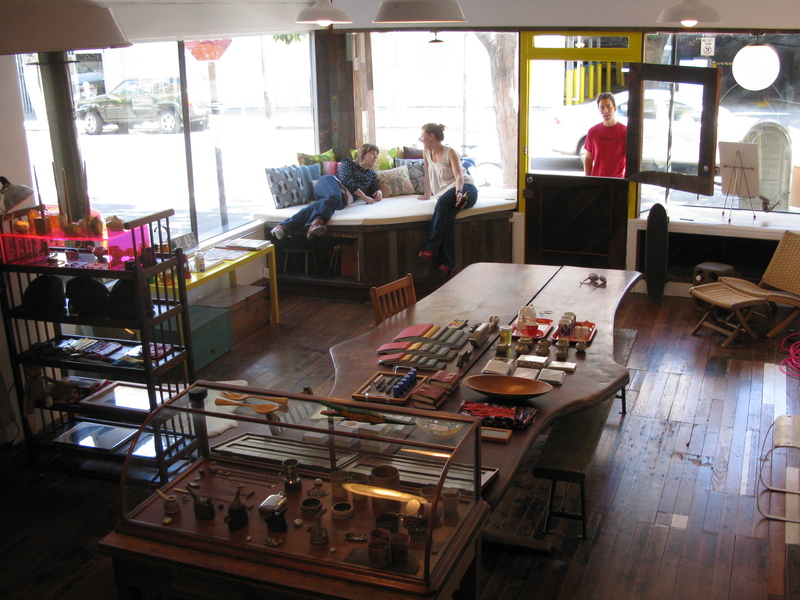 woodworkers in particular helped out a ton with their storefront and interior – Ajax Oakford and Keith Aderholdt. Handful of Salt might have to get in touch with these gentlemen…what beautiful work they have created. Gravel and Gold was started and is run by three artsy gals (all creative in their own right! – I think they all do their own crafting, some featured in the shop itself). They host events and workshops, and do a ton to profile their Makers – both local (which Handful of Salt loves) and outside of the Bay Area. You can get the most up to date information and hear about all the goodies by reading their blog. While Gravel and Gold is a bit more focused on crafts and smaller goods – not necessarily largescale furniture and homeware pieces (although there are some) that Handful of Salt focuses on – we really love what they’ve done to decorate the place, to invite community members in, and to highlight the great work of their artisans. Check out the Makers page (wonderful, simple layout) to learn more about the people behind all of the amazing items in their store. Oooh and we love their business cards, which are made of recycled paper and have their name printed in a handmade, sketched effect. Very cool. Definitely check out the store if you’re in the neighborhood, or at least dink around their site online. Happy hunting! This entry was posted in Uncategorized and tagged Artisan, DesignCraft, Handmade, Home accessories, San Francisco Bay Area, Store. Bookmark the permalink.